Turkey is schizophrenic about human rights. The country has made important steps towards protecting minority rights at home and reducing conflict in the region. But at the same time it continues to brutally silence critics – unable to tolerate either political opposition or those who challenge the myths of the Turkish nation. The European Commission is expected to say as much today in its yearly report on Turkey’s progress toward EU membership. Media reports citing draft versions of the report suggest the criticisms will be loud and familiar: more progress is needed in political and economic reforms; recent high profile court cases smack of governmental abuse of power against political opponents; the state needs to stop meddling with freedom of expression and a free press if it wants to be accepted in Europe. The highest profile recent example is the $2.5bn fine given to the Dogan Media Group for tax evasion. The massive conglomerate is a frequent critic of the government, charging it with being too Islamic. A Turkish court yesterday refused the company’s collateral for the fine, making it easier for the government to seize Dogan’s assets and shut it down. The case has many similarities with that against Yukos in Russia, which allowed the Kremlin to dismantle the country’s largest oil company in retaliation for its political independence. Perhaps the most absurd law suppressing freedom of expression – for which Turkey continues to be criticised by the EU and others – is Article 301 of the Penal Code. The law, which criminalises “insulting Turkishness”, was refined this April – in a sop to critics – to the more concrete “insulting the Turkish nation”. YouTube is still unavailable in Turkey – a court ordered its shutdown in 2007 after some Greek users suggested that Turkey’s founding father, Mustafa Kemal “Ataturk”, had been a homosexual. Article 301 was used to bring 527 cases to the Turkish courts last year. It’s difficult to imagine such an offence being needed in any other country that’s as confident and strong as Turkey portrays itself. What would offending “Frenchness” entail, for example? Red wine with fish? Turkey is highly sensitive on this issue of “Turkishness”. The sorest spot is a historical question concerning the organised mass murder of hundreds of thousands of ethnic Armenians in Turkey in 1915. Armenians say it was genocide. Turkey refuses to consider the “G word” because it challenges Turkey’s view of its great history. Turks maintain they fought Armenians in self-defence. The root of Turkey’s insecurity dates back to the founding of the republic in 1923. 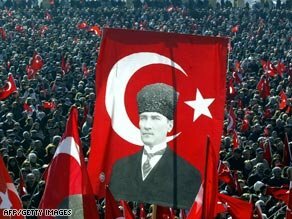 The founders, led by Ataturk, wanted to forge a modern, western-style republic from the ruins of the Ottoman Empire, an ancient and corrupt caliphate. It was decided that a good citizen of the Turkish Republic must be three things: an ethnic Turk, a Muslim and a secularist. This rigid notion, fashionable at the time, is now colliding with other identities that have always existed but are only now being expressed openly. Turkey’s prime minister, Recep Tayyip Erdogan, was himself jailed 11 years ago for reading a poem, as his Islamicist political beliefs conflicted with Turkey’s unbending secularism. Yet since coming to power in 2002, analysts note that his government has used Article 301 and other legal provisions to file court cases against more than 60 media companies, writers and journalists, including cases involving satirical political cartoons. The political elite clearly does not want to limit their arsenal of weapons against opponents by dropping Article 301 altogether – whatever their party. The highest profile recent example is the €1.7bn fine given to the Dogan Media Group for tax evasion. The massive conglomerate is a frequent critic of the government, charging it with being too Islamic. A Turkish court yesterday refused the company’s collateral for the fine, making it easier for the government to seize Dogan’s assets and shut it down. The case has many similarities with that against Yukos in Russia, which allowed the Kremlin to dismantle the country’s largest oil company in retaliation for its political independence. Perhaps the most absurd law suppressing freedom of expression – for which Turkey continues to be criticised by the EU and others – is Article 301 of the Penal Code. The law, which criminalises “insulting Turkishness”, was refined this April – in a sop to critics – to the more concrete “insulting the Turkish nation”. YouTube is still unavailable in Turkey – a court ordered its shutdown in 2007 after some Greek users suggested that Turkey’s founding father, Mustafa Kemal “Atatürk”, had been a homosexual. Article 301 was used to bring 527 cases to the Turkish courts last year. It’s difficult to imagine such an offence being needed in any other country that’s as confident and strong as Turkey portrays itself. What would offending “Frenchness” entail, for example? Red wine with fish? Turkey is highly sensitive on this issue of “Turkishness”. The sorest spot is a historical question concerning the organised mass murder of hundreds of thousands of ethnic Armenians in Turkey from 1915. Armenians say it was genocide. Turkey refuses to consider the “G word” because it challenges Turkey’s view of its great history. Turks maintain they fought Armenians in self-defence. The root of Turkey’s insecurity dates back to the founding of the republic in 1923. The founders, led by Atatürk, wanted to forge a modern, western-style republic from the ruins of the Ottoman Empire, an ancient and corrupt caliphate. It was decided that a good citizen of the Turkish Republic must be three things: an ethnic Turk, a Muslim and a secularist. This rigid notion, fashionable at the time, is now colliding with other identities that have always existed but are only now being expressed openly. Turkey’s prime minister, Recep Tayyip Erdogan, was himself jailed 11 years ago for reading a poem, as his Islamicist political beliefs conflicted with Turkey’s unbending secularism. Yet since coming to power in 2002, analysts note that his government has used Article 301 and other legal provisions to file court cases against more than 60 media companies, writers and journalists, including cases involving satirical political cartoons. The Turkish political elite clearly seems reluctant to surrender a powerful weapon against critics whose ideas it finds annoying or inconvenient. By dropping article 301 altogether, Turkey would show the confidence and political maturity it needs to be a member of the European Union.